What do you think of when someone mentions the Middle Ages? I’d say caves, toga-like clothing, candles, definitely a lot of candles, witches, the burning of said witches, and ceaseless devotion to God. Often, when the internet in my apartment isn’t working, I tell friends “I’m living in the Middle Ages” – which has more candles than devotion to God and witch burning. Honestly, let’s face it, what else was there to do between the 5th and 15th centuries aside from worship God, be a witch or burn them, participate in the many crusades, and wait to meet your maker? If you think about it, maybe part of the reason life expectancy was so short is because it is actually possible to die of boredom*. People talk about time machines and how incredible it would be to go back (or forward, for that matter) in time, but we’re living in the best time to be alive. We’ve got television and Batman; internet and Ryan Gosling. I wouldn’t have survived ten minutes in the Middle Ages, but would happily see how those that did, entertained themselves. 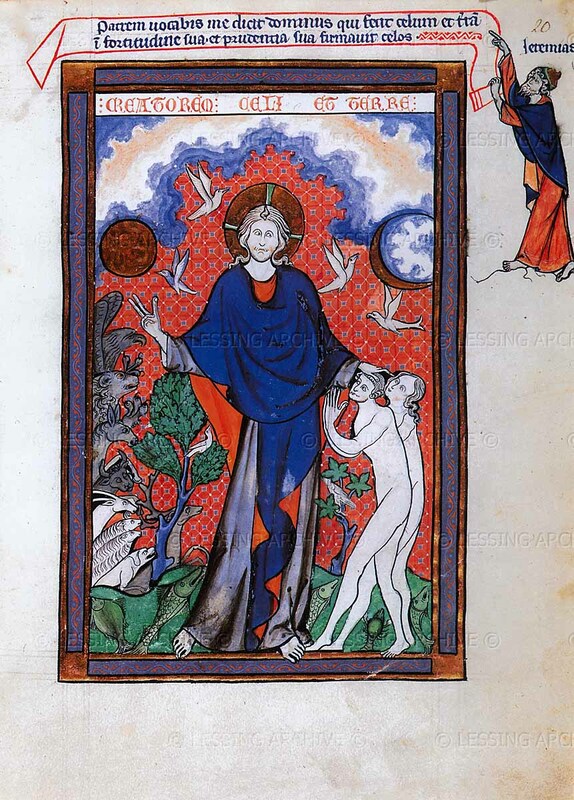 The Rheims Missal (Missale Remenense), The Creation of the World, 1285-1297. Parchment, Latin, 23.3 x 16.2 cm. 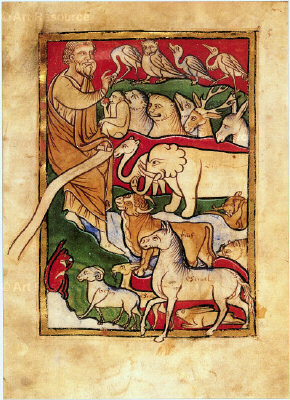 Bestiarum, Adam Naming the Animals, late 12th century. Parchment, Latin, 20 x 14.5 cm. The Getty is at it again, exhibiting religiously charged images, starting this month through 3 February 2013 (assuming the world doesn’t end first and we meet the Powers that Be in person): The Art of Devotion in the Middle Ages. Often find yourself without internet or electricity, or do you simply want to go back in time? Procure this fantastic representation of manuscripts of the period: Illuminated Manuscripts by Edmond de Goncourt and Jp. A. Calosse. *Research was still being conducted at time of posting.